It’s got entire sections in French, which I don’t happen to speak, and there are no surtitles to aid understanding, though to be fair we are told enough times the central character, Mrs Ada Harris (Clare Burt), is saving up to go to Paris, back in the days when people saved up for anything – and, further, she has the strength of character to actually do what she set out to do. As a fellow theatregoer pointed out afterwards, such was her integrity that she’d make a lousy politician. The show also has a very sluggish start, which made me wonder what on earth I’d let myself in for. But at some point – I can’t even recall precisely when – Flowers For Mrs Harris stopped being about the drudgery of daily working-class life and became something uplifting and extraordinary. When Mrs Harris finally boards a plane and takes off, it’s a metaphor for the production – it becomes airborne at last, and there’s no going back. Ten musicians, under the baton of the fresh-faced Tom Brady, manage to sound like they are more than double their number. 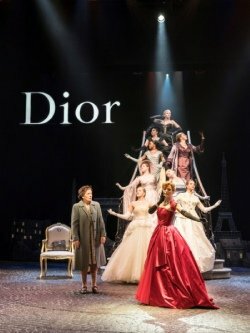 The production is also extremely well-cast, with all except Burt and eight models (Ella Bassett-Jull, Skye Broughton, Lydia Hague, Ella Jarman, Emily McAlpine, Charlotte Schofield, Freya Shepherd-Bland and Evie Shiner) playing at least two roles – Gary Wilmot and Luke Latchman manage four apiece. Laura Pitt-Pulford displays remarkable versatility, as the slightly vacuous Pamela (who comes to her senses in the end) and as Natasha, one of Paris’ top models, from a humble background, which is worth mentioning if only for her wondrous reaction to the prospect of joining Mrs Harris in tidying up the apartment of André Fauvel (Louis Maskell), whom I deduced to be the finance manager for the House of Dior. For those who have read the novel by Paul Gallico of the same name, the musical adaptation of Flowers For Mrs Harris is faithful to the original overall. To quote the old adage, a picture paints a thousand words, and in a scene or even a facial expression, paragraphs of description in the novel are perfectly summarised on stage. There are, as one might reasonably expect, some differences between the book and the show, but the changes, far from diminishing the production, increase its poignancy and gentle nature. It helps, too, that Mrs Harris is incredibly straight-talking and earnest, devoid of the pretentiousness of many of her ‘clients’ in London (that is, well to do people for whom she performs housekeeping duties for) and certain customers that the Dior management must contend with. My own reaction to proceedings was not entirely dissimilar to Madame Colbert (Joanna Riding), who began with more than a modicum of frustration, but was soon bowled over by the refreshing and down-to-earth Mrs Harris. I suppose it is easy to be nice to nice people, and there’s a lesson to be learned in financial prudence as Mrs Harris lives within her means, cutting back on visits to the cinema and doing overtime, in order to realise her ambition. Violet Butterfield (Claire Machin) is utterly marvellous as Mrs Harris’ best friend and confidante. There are various factors that Mrs Harris has carefully considered, and various other factors that she simply wasn’t aware of, but where there’s a will, there’s a way. The real beauty of the production is in putting an older lady at the centre of it all – some older actresses have, with justification, raised concerns about the lack of roles for them to play. Yes, the Chichester Festival Theatre’s revolve is used and used until one starts to feel dizzy. Yes, nobody (as far as I could hear) was humming the tunes on the way out. But the production more than makes up for that in its emotional depth and poignancy. A subtle yet triumphant show that charms, blossoms and delights.